Spiritual battle! It can be so intense sometimes. Satan is so crafty in his attack plans. He can take something that blesses me and draws me into a more intimate presence with God and twist and distort it until it becomes something that completely shifts my focus from being about God to being about me. Do you ever struggle with doing something for God that you don’t have any confidence in your own ability to do? That’s where my struggle is; allowing my confidence in God to override my lack of self-confidence in order to serve Him. In the midst of this struggle, the Spirit has led me to 2 Corinthians. Paul talks about everything they (he and Timothy) have gone through in order to spread the gospel. He makes the statement that all this has “…happened that we might not rely on ourselves but On God, …). So for today, I’ve picked back up my battle shield, fallen in line behind my Protector, and I’m willing to let Him do what I can’t do myself. 9 … "My grace is sufficient for you, for my power is made perfect in weakness." Therefore I will boast all the more gladly about my weaknesses, so that Christ's power may rest on me. 10 That is why, for Christ's sake, I delight in weaknesses, in insults, in hardships, in persecutions, in difficulties. For when I am weak, then I am strong. My grace is enough; it's all you need. My strength comes into its own in your weakness. Once I heard that, I was glad to let it happen. I quit focusing on the handicap and began appreciating the gift. It was a case of Christ's strength moving in on my weakness. Now I take limitations in stride, and with good cheer, these limitations that cut me down to size—abuse, accidents, opposition, bad breaks. I just let Christ take over! And so the weaker I get, the stronger I become. The latest news on the family front is that Abijah is at home now!!!! 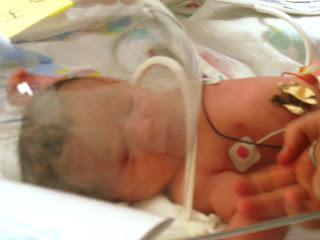 After 9 ½ days in the NICU at Southcrest Hospital, she is at home and doing fine! The rest of us are doing GREAT!! I got to hold her Sunday night and of course I think she is beautiful. I’ve never really been able to look at a baby and tell who they look like, but word is she looks more like her Mommy’s family than Ethne did. I think that’s great since I had three children and they all looked like Van, I’m glad Ashlee may have one that looks more like her side of the family! So here goes my randomness….. I had partial cornea transplants on my eyes when I was 4 and 5 yrs. old. (they did only one eye at a time) Thanks to those organ donors, I am able to see today. The prognosis would have been blindness without their gift of sight. While in the hospital in Dallas during for one of my transplant surgeries, John F. Kennedy was shot and brought to the hospital I was at before they took him to the trauma hospital. While attending a magic show of Henry Blackstone, Jr.
(http://www.amdest.com/stars/harryb.html) with my parents as a young adolescent, I was chosen from the audience to help the magician with “the Vanishing Birdcage” trick. When he made it vanish right out of my hands, it startled me and I quickly pulled my hands away backhanding him across the face – right there on stage in front of everyone!! I lived on my grandparents’ farm every summer from 1st-9th grade. I lived the “Little House on the Prairie” lifestyle complete with washboards, outhouses, chicken coops where it was my job to gather the eggs, cattle round-ups, etc… I got to ride horses, chase the barn cats, plant gardens, pluck chickens, slop hogs, climb trees, grow watermelons, etc… It was a great life except for the days when we would brand the cattle, prepare chickens for frying, and I wasn’t crazy about the outhouse experience. They didn’t have indoor plumbing until I was in Junior High so we took baths the old fashioned way, just like on the old Western movies! Of course it was usually one tub bath a week (Sat. night), the rest of the time it was a sponge bath with a wash basin! I’m terrified of birds. I got pecked by too many hens and chased by too many mean roosters. I’m not kidding, I’m really terrified. Once while looking at used cars at a lot, someone’s trained pigeon was loose and tried to land on my shoulder. I went into hysterics and it continued to try to land on my shoulder! To escape, I finally hid under a car!! The movie, The Birds, may just be a movie to you; to me, it’s my worst nightmare!!!!! I swam on a synchronized swim team in Junior High. That’s what peer pressure will do for you! I hate to be in the water and to this day I hold me nose if I have to go underwater. I don’t know how I ever survived that experience!!! I was the Drum Major of my high school marching band my senior year. I was told it was the first time a girl had been the one and only Drum Major. No, I didn’t wear a skirt; I wore the same uniform the guys did. I was tall and very skinny and you couldn’t tell I was a girl (I know that doesn’t say much for my figure at the time!) until we got in the stands and I took the big tall hat off and all my long hair would come falling down my back. It took quite a few people by surprise. I did the kick strut across the field and everything! While on a date with my now husband in college at Pizza Planet in Edmond, I accidentally got locked in the restroom when the lock broke off the door. No matter how hard I pounded on the wooden door and yelled, no one could hear me. When our pizza arrived and I still hadn’t returned from the restroom, Van sent a friend of mine to check on me. I explained the situation to her, she told Van, the manager came and at the top of his lungs yelled, “Stand back M’am we’re going to kick the door in!” Let’s just say it was more than a little embarrassing to walk out after that, but hey, Van married me anyway!!!!!!! Since almost everyone I know has already been tagged, my tagging will be limited to Betty (jettybetty) and John Cope! When a precious couple from our church faced life threatening complications during their son's birth, I was always touched by how he would allow himself to see the humor in some of the things that occur during this time. 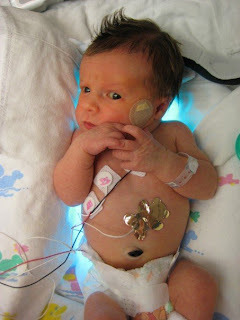 Let's face it - if you've never seen a baby in the NICU, you've missed some interesting equipment. So, as our little Abijah continues to grow stronger and anticipate her escape from the NICU, I give you some of the lighter moments of life in the NICU! On the day of her birth, Abijah was immediately admitted into the Future Astronauts of America Training Program. As the days went by, she didn't want to miss out on her opportunity to sport a tan when she left the hospital. Here she is catching some rays under the bili-light. Some women pay big bucks for tans like this!!! And finally here is a musical tribute to a precious baby girl who can't wait to get home to her Mommy, Daddy, and big sister! If you know the song "The Days of Elijah" then hum along!! Prepare cause I’m coming home soon! Behold she’s here! Such a precious one! So lift your voice & celebrate with me! Baby Abijah is finally here! Life can sure come at you fast sometimes. We are so thankful to God for watching over our sweet new granddaughter and her Mommy. Abijah (A-bi-jah, think Elijah with an “Ab” instead of an “El”) Linn Priest was born Thursday at 1:47 pm, weighing in at 6 lbs. 11 oz. and stretching 19 ½ “ long. Her name is found in several places in the Bible and can be a male or female name. Abijah was the daughter of Zechariah and the mother of Hezekiah. Her name means “My father is Jehovah”. She is, of course, beautiful!! Her mommy has had a really rough time the last several weeks. Two weeks before her birth, Ashlee began having contractions and continued to have them the whole time. Four different times they became so hard and so regular that the doctor had them go to the hospital to be monitored and receive medication to stop the contractions so the baby could grow and develop a little more. There has been some uncertainty about her due date, but the doctor had concluded July 8th from her ultra-sound. The contractions never stopped. By last Thursday, June 28th, there was no delaying any longer! We were all so happy for Ashlee because it had been a very rough and painful two weeks leading up to this moment. At the hospital, they gave her a spinal block and began preparing her for her C-section. After a little while they discovered the spinal had not taken so they gave her another one, waited for a few moments and then headed for the delivery room. At first, everything appeared fine so they were ready to proceed, but that is when the problems began. Ashlee felt some discomfort with the first incision but wasn’t sure what was happening. It wasn’t until they made the second deeper incision and she screamed that they realized the second spinal had not worked either and she was feeling everything!!!! At that point they put medicine into her IV to knock her out and hurried Michael out of the delivery room. During the delivery, Abijah swallowed some amniotic fluid so she has been in the Neonatal Intensive Care Unit ever since. 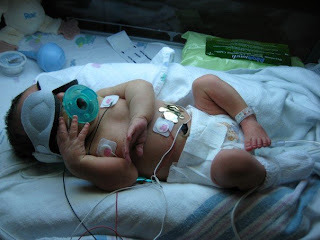 One nurse referred to Abijah’s problems as “wet lung” syndrome which is apparently a common problem for C-section babies and something I read said even more so if the mother had been in labor before the C-section. Two weeks of labor prior to the C-section probably made this unavoidable. It was a good thing that they had taken Abijah this week. She was bruised across the top of her forehead and under one eye, and all down her back from the constant contractions Ashlee had been having. I can’t imagine how much more she would have been bruised if they had waited another week. Ashlee is recovering at home now, but without her sweet baby in her arms as Abijah remains in NICU on oxygen, a feeding tube, and under the light for jaundice. Please pray for our sweet Abijah to grow stronger quickly. Please pray for our precious daughter-in-law, Ashlee, as she struggles with aching empty arms that long to snuggle and cuddle her precious daughter. Please pray for our precious son Michael as he also longs to hold and cuddle his precious daughter and watches his wife’s pain and disappointment through something he can’t fix. Please pray for big sister, Ethne, who even though she is only 17 months old, knows that something really big is going on!